These services can be provided by Axiom’s certified and licensed asbestos consulting personnel. Axiom maintains licensed personnel in Massachusetts, Maine, New Hampshire, New York, Rhode Island and Connecticut to support our Asbestos Management Services. Axiom is qualified and licensed in the above states and comply with federal EPA NESHAPs and AHERA regulations in conducting building surveys to identify, quantify, and assess the condition of asbestos materials. Survey protocols typically include review of existing records and drawings, collection and analysis of bulk material samples from suspect materials and preparation of an inventory (location and amounts) of identified asbestos-containing materials (ACMs) and/or Asbestos-Containing Building Materials (ACBMs). In addition, Axiom can prepare AutoCAD drawings showing survey data and provide an assessment of actual and potential hazard associated with ACMs. When ACMs and ACBMs are identified in schools, Axiom can prepare EPA/state required Asbestos Management Plans (AMPs). These AMPs typically including assessment of the hazard posed by the ACM/ACBM; monitoring air and dust to define potential exposure sources and their significance; evaluating abatement alternatives; assessing regulatory impacts; defining and analyzing the costs of management alternatives; and the preparation of the written plan. Axiom is regularly requested to provide development of effective abatement programs to minimize lost time and costs. Typical tasks include pre-design site investigation; concept and design report and review meetings; complete development of drawings, specifications (multiple formats to suit project and client), abatement cost estimates; pre-bid conference and bid review assistance; pre-construction counsel to building users and client; and careful review of contractor’s pre-construction submittals. 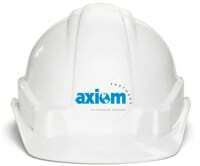 Axiom, acting as an independent third party, performs on-site management and inspection to determine compliance with regulations, plans, and specifications. In addition, Axiom provides air monitoring services, preparation of initial project information documents, issuance of initial construction schedules and weekly updates; weekly/monthly progress reporting; continuous observation of the abatement process; performance of approval inspections; maintaining written logs of contractor’s staffing levels, accomplishments, deliveries, and site visitors; review of contractor’s safety and accident prevention program; on-site analysis of air samples; and preparation of final project Compliance Monitoring Reports. Axiom’s team of professionals is ready to provide your staff with the knowledge and education they need to identify and control asbestos exposure hazards in the workplace. Axiom can prepare an Asbestos Operations & Management program to provide you the tools to prevent accidental disturbance of ACMs/ACBMs. This program and the accompanying training provide your employees with critical information, including the location of ACMs/ACBMs, how to work safely in proximity to these materials and what to do when ACMs/ACBMs are disturbed. These programs can be a critical component to ensuring a safe workplace. Axiom inspectors and project monitors collect a variety of asbestos samples, including Air, Wipe and Bulk samples. Typical of the survey process, bulk samples of suspect materials are collected and sent to a qualified and licensed laboratory for microscopic examination to determine if asbestos fibers are present. During removal of ACMs, air sampling is performed to provide information of airborne levels of asbestos fibers. The two most frequent types of air samples collected are Phase Contrast Microscopy (PCM), which are analyzed by AXIOM’s technician in our own lab, and Transmission Electron Microscopy (TEM) samples which are analyzed at a laboratory. In addition, wipe samples are occasionally collected during survey and/or abatement projects to confirm the presence or absence of asbestos fibers in settled dust.